Memorial for couple murdered in front of their children by terrorists vandalized by Arab rioters. The memorial to terror victims Rabbi Eitam and Naama Henkin was vandalized this morning by Arab rioters. 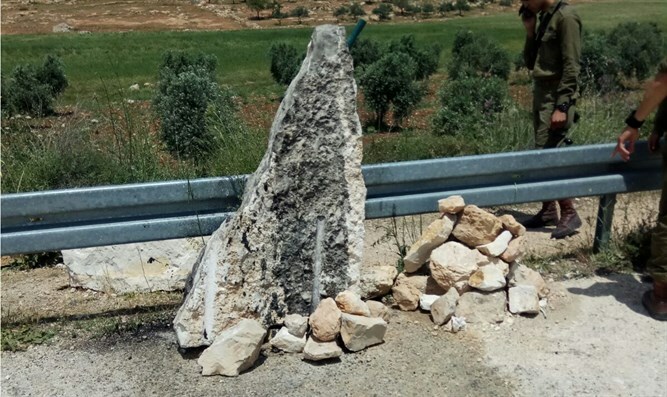 The Judea and Samaria District Police said that "a report was received regarding the causing of damage and the dumping of material on the monument, which was established in memory of the late Henkin couple." The Henkins were murdered in 2015 by Arab terrorists who opened fire towards their vehicle as they were driving between Itamar and Elon Moreh in Samaria. They were murdered in front of their four young children. MK Bezalel Smotrich slammed the vandalization of the memorial. "I wonder if it will be presented on the news broadcasts as a 'price tag' attack and if the Shin Bet will do anything to catch the perpetrators. Maybe this time I will not be disappointed," Smotrich wrote on his Twitter account.